The Yorkshire Building Society is to take over its smaller rival, the Barnsley Building Society. 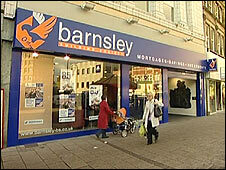 The Barnsley said it was protecting itself against the possible loss of up to £10m deposited with Icelandic banks. The deal is the latest among the UK's building societies resulting from the international financial crisis. The deal is expected to be completed by the end of the year and there will be no windfall for Barnsley savers, nor will there be a vote of members. "The proposal follows swift, pre-emptive action from the board of the Barnsley in approaching the Yorkshire to seek a merger after the identification of possible losses of deposits with Icelandic banks," the two societies said in a joint statement. In September, the UK's biggest building society, the Nationwide, agreed to stage a rescue takeover of two small societies, the Cheshire and the Derbyshire. It said that while it had reserves large enough to absorb the loss of its £10m deposits, it had decided that being taken over by a larger society would be in the best "long-term interests of its members". The Barnsley is the latest victim of the implosion of the Icelandic banking system, which has seen hundreds of thousands of UK savers losing access, for the time being, to their money held in accounts of the Icesave internet bank and other Icelandic banking operations. The society had its money on deposit with Kaupthing Singer & Friedlander (KSF) and with the Heritable bank, owned by Landsbanki, the parent of Icesave. Personal savers with KSF and the Heritable were offered protection when the UK authorities arranged for their accounts to be taken over by the Dutch bank ING Direct. However, the Barnsley has found itself in exactly the same position as dozens of local authorities, charities and other organisations who had more than a billion pounds between them on deposit with Icelandic banks. They were not covered by the UK's Financial Services Compensation Scheme and will have to wait for the outcome of the current negotiations between the UK and the Icelandic governments to see how much money, if any, they will get back. "The current exceptional situation in Iceland and the full extent of the repercussions were beyond anticipation," said the Barnsley's acting chief executive, Steve Mitchell. Two weeks ago the Chelsea building society revealed that it had £55m on deposit with Icelandic banks. The Yorkshire is the UK's third-largest building society, with 136 branches and 1.9 million members. The Barnsley has only eight branches and 60,000 members and is the 34th largest society in the UK. The Yorkshire says it will now try to recover the Barnsley's money from the Icelandic banks. If it is successful, it may hand this cash back to the former Barnsley savers and borrowers as an "ex-gratia" bonus payment, minus any legal expenses and tax. A Yorkshire spokesman described this as a "friendly gesture", but stressed that it was not guaranteed. Some jobs may go as a result of the takeover. Staff in the branches, which will keep the Barnsley name, will be kept on, but some jobs may go when the 50 staff in the Barnsley's headquarters are transferred to the Yorkshire's head office. However, a Yorkshire spokesman said it was hoped that most of the transferring staff could be absorbed without redundancies. The Building Societies Association (BSA) revealed two weeks ago that its members had about £200m in Icelandic banks, but said this amounted to just to 0.05% of total assets.